Football may not have been the main sport for golf icon Jack Nicklaus, but there is no doubt that he and his wife, Barbara, will be serving a scoop or two of JACK NICKLAUS Chocolate Peanut Butter Swirl ice cream as they support their alma mater, The Ohio State University, and cheer on the Buckeyes this football season. The 2014 National Champions kick off another season on Sept. 3 at home in “The Shoe” against Bowling Green State University. Jack’s father, Charlie, played football at Ohio State, and Jack grew up a passionate Buckeyes fan, who didn’t miss a game from age 6 to 20. So there was no doubt where Nicklaus would play his college golf. As one of the most-decorated Buckeyes in history, Nicklaus won a Big Ten and NCAA title at Ohio State, as well as two U.S. Amateur Championships. He turned professional in the fall of 1961, and was awarded an honorary doctorate from Ohio State in 1972. He was inducted into the Ohio State Athletic Hall of Fame in 1977. But arguably the most important thing to happen to Jack Nicklaus while at Ohio State, and what certainly shaped the rest of his life, was meeting Barbara Jean Bash on the steps of Mendenhall Laboratory during their first week on campus. The two were married in 1960, and are the parents of five children and grandparents to 22. The Ohio State mascot has the same name given to Ohio residents—Buckeyes. In Jack and Barbara’s native Midwest, buckeyes are also a popular candy made by dipping a ball of peanut butter fudge in chocolate. Makers of the candy typically leave a small circle of peanut butter visible to give it the look of the buckeye nut. Knowing the Nicklaus family’s love of chocolate and peanut butter—and their affinity for both Buckeye athletics and candies, The Schwan Food Company’s ice cream developers went to work with Jack and Barbara to develop a flavor inspired by buckeye candy. JACK NICKLAUS Chocolate Peanut Butter Swirl starts with our richest chocolate ice cream. Then we add miniature peanut butter cups and chocolate covered peanuts. We finish it all off with a delicious peanut butter swirl. Altogether, you get a delectable treat with the perfect variety of flavors and textures. Fellow Ohioans and ice cream enthusiasts alike are sure to love Chocolate Peanut Butter Swirl. 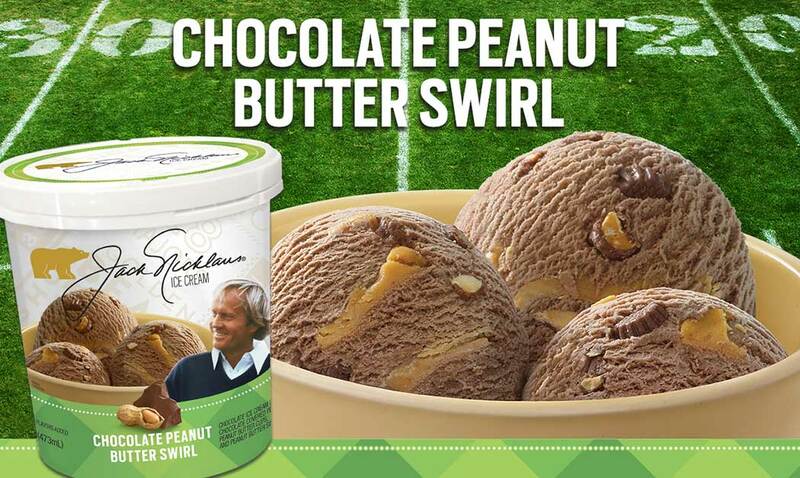 Today, you can find JACK NICKLAUS Chocolate Peanut Butter Swirl and other flavors in select grocery stores. You can visit the Where to Buy page to learn where you can find the ice cream.